In the Enterprise Division The Apollos met strong opponents in E.I. Titans And managed just a single drawn rink from Ramsay Sinclair, Brian Gardiner and Alex Morrice 16 shots apiece.Overall shots 94-64 to the Titans, and just one point to the Apollos. In the Voyager Division La Siesta Sputnicks entertained the Pioneers and although 4 of the 5 rinks were close affairs it was the Pioneers who came out worthy winners on all but one rink with the overall shots difference being 105 to 65.Well done to the rink of Irene and Dave Laverick with Val Dalton with a resounding victory for the Pioneers whilst for the Sputniks the winning rink by 15 shots to 13 came from Kathleen Morrisoe, Ken Stringfellow and John Clarke.So 10 points to the Pioneers and 2 to the Sputniks. In the Winter League La Siesta travelled to La Marina and lost by 89 shots to 77 winning on 2 rinks.The winning rinks came from Barbara Cooper, Alan Mawer,with Florence and Mike Edwards with a convincing 24 shots to 9 win whilst Bill and Sue Jordan with Jim Hudson and Dave Laverick won by a single shot 16-15 So 4 points to La Siesta and 8 to La Marina. In the Fed4’s the Hoopoes had a difficult time against Greenlands with the home side winning on all 4 rinks picking up the maximum 8 points. In the Southern League A Division the Blues in Division A travelled to San Miguel to play the Bulldogs and in a close match narrowly lost by 83 shots to 72.Results on the rinks were shared with wins for the Blues being provided by Dawn Taylor,Harold Charleton and Irene Mangan 18-14 whilst Trish and Pat Reilly with George Richardson won 18-15.Ramsay Sinclair with John Taylor and Alex Morrice drew their match 15 shots all.5 points to La Siesta and 7 to San Miguel. The Golds in B Division were at home to San Miguel Boxers in a match that finished with both sides scoring 81 shots. Winning rinks for the Golds came from Barbara Cooper with Irene and Dave Laverick 21-13 whilst Jo Elkin with Tony Campbell and Vic Mahomet won 18-15.The other winning rink was Derek Smith with Gordon Dall and Alan Mawer winning 15-14. With the overall shots in the match tied The Golds picked up 7 points to 5 for the Boxers. 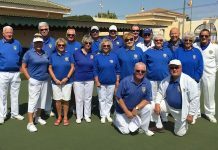 In Division C the Silvers were at home to a strong Vistabella Swingers and managed to win on the rink of Dot and Joe Kocsis with Alan Ralph winning 21-19 picking up 2 points for the Silvers to the 10 points to the Swingers. This all Monte Mar match was played on a lovely sunny but cold morning. With the first match earlier in the season ending six each a similar outcome was expected by many members. On the day the Toreadors produced an excellent team performance winning on four rinks and losing on one. It was nice everyone enjoyed a drink together afterwards and the Matadors were quick to congratulate the Toreadors on their performance. 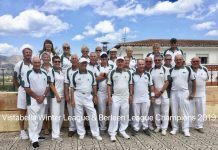 A closely contested match between the Toreadors and the Pathfinders at La Marina with the Toreadors winning on two rinks and losing on three. Well done to our winning rinks of Sheila Roberts, Rita Towle skip Graham Smythe, Peter Wallis, Ian Hamilton, skip Dave Eades. At home to la Marina Explorers, it was a lovely day for bowling. We won on three rinks and lost on two well done Tanya Oliver, Bill Judd skip Jack Burrell, Lynne Armitage, Ronnie Cairns skip Dave Melville, Pauline Merry, June Young skip Chris Merry. well done to Sheila Roberts, Julia and Ian Hamilton skip Phil Goble, Tanya Oliver, Howie Wiliiams, Jan Gatward skip Graham Smythe, Lynne Armitage, Dave Thomas, Jack Burrell skip Margaret Finlayson. Another busy week for our squads with the added bonus of excellent conditions, warm sunshine and games played in good spirit. In the South Alicante Winter League. Quesada Pearls hosted Quesada Diamonds in a well fought match which resulted in a narrow win for the Pearls. Both teams won on two rinks and drew on one rink. Pearls won the shots 93 to 83 so the points were 7 to the Pearls and 5 points to the Diamonds. This means the Pearls maintain their 4th place in the league. Meanwhile, Rubies put up a good fight against El Rancho Pintos securing a 6 points draw from their away match which ended with El Rancho 80 points to Rubies 78 shots. Well done Rubies. In the Southern League, Quesada Swifts hosted Horadada in a very close match with Swifts securing a win on 3 rinks and the overall shots 89-80. The match ended with Swifts 8 points and Horadada 4 points. In the Winter league, Quesada played away to Emerald Isle and after a tough match, Emerald Isle won 8 points to 4 and 94 shots to 75. In the Federated 4’s, after a bye last week, Quesada Panthers played San Luis Condors. Quesada won on all of the rinks securing 8 points with the shots 62-29. Although the weather has been quite bright and sunny, unfortunately some of the results this week haven’t been quite as good. Hopefully our teams can bounce back next week. SA League Monday 14th Klingons v Trekkers; a close fought game; 95shots-73, 8pts-4. Klingons Winners: Colin Jackson, June & Keith Jones, 19-12, Margaret Morrison, Ray Clarke, Neil Morrison 23-10, William Holtham, Sabrina & Russell Marks 21-11. Trekkers Winners: Shirley Verity, Jo & Jules Pering 21-15, Allen Bowen, Suzi Cooper, Scott Malden 19-17. Romulans v Vulcans a good result for Romulans; shots 89-87, 8pts-4. Winners: Pauline Johnson, Roger Inwards, Mario Cavilla 21-15, Val & Allan Lever, Joe Millis 21-18, Robert Hicks, Bob Bruce, Lyndon Johnson 23-13. Vulcans Winners: Audrey Ford, Kevin Hull, Bob Bromley 22-12, Chris Jackson, Sue Ross, Drew Russell 19-12. Wednesday 16th Winter League: home v Greenlands, a very positive result: 10pts-2, 129 shots-65. Winners: Pam Lockett, June Jones, Peter McEneany, Keith Jones 30-13, Kath Reid, Giuseppe Galelli, Neil Morrison, Ian Kenyon 31-9, Ros Holmes, Jo Pering, Ray Pollock, Julian Pering 26-10, Jan Pocock, Keith Phillips, Dave Blackie, Scott Malden 26-13. FED 4’s League: Thursday 17th Ospreys away v SM Cherokees a hard fought match, 2 pts-6, 42 shots-64. 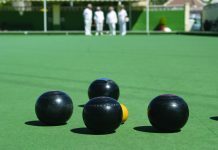 Winners: Pam Lockett, June Jones, Ray Clarke & Keith Jones, (snatching the win with the last bowl of the match) 17-16. Condors had a tough match away v Q Panthers, 29 shots-62, 0pts-8. Bazas home v Country Bowls, not a good day, 36 shots-62, 0pts-8. 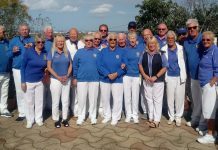 Southern League: Friday 18th Lions home v VB Picadors a great result; 12pts-0, 134 shots-63 Winners: William Holtham, Ray Clarke, Keith Jones 35-8, June Jones, Pam Lockett & Ray Pollock had a great fight back to win 18-17, Kath Reid, Pam Lockett, Ian Kenyon 35-10, Margaret Morrison, Keith Phillips, Neil Morrison 23-17, Bob White, Janet & Peter McEneany 23-11. Tigers, home v EI Claymores, a very close match 90shots-93, 4pts-8. Winners: Kevin McKenna, Marina Beardsall, Barry Edwards 21-18, Margaret Roseveare, Peter Fuller, Les Bedford 23-22. Leopards v MM Matadors, a long journey for 0pts-12, 71shots-100. Pumas, away v GL Elms a useful result 6-6, 83 shots-96. Winners: Pauline Johnson, Chris Lythe, Roger Inwards 20-17, Pat Barnes, Danny McErlean, Tom Fromson 26-9, Chris Phillips, Mary Fromson, Geoff Francis 17-14. 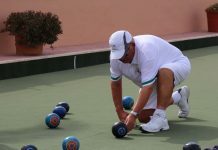 For more information, SLBC website: www.sanluisbowls.byethost7.com or contact June Jones, Club Captain: 691903773. 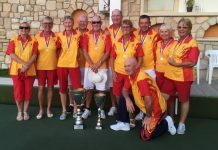 San Miguel Dalmations, home to Horadada Falcons, on Monday, had a great win gaining all twelve points (120 shots to 55), the trio of Bob Nesbitt, Dave Champion & Barbara Scotthern had the best win with 32-4. The San Miguel Alsatians were home to San Miguel Beagles, with the Beagles winning 8-4, (87 shots to 75). The best triple from the Alsatians was Ian Hope, Ken Hope and Cliff Plaisted, 16 shots to 11. The winning triple from the Beagles were Reg Cooper, Gail Willshire and Fred Willshire with 24 shots to 15. The San Miguel Apaches also played at home winning 6-2. 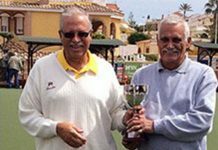 The San Miguel Pointers played their match in mid December, results already posted. San Miguel were home to Vistabella in the winter league, with San Miguel winning 8-4, (82 shots to 74). There were two rinks winning by 7 shots, Noel Davis, Dave Johnson, Gail & Fred Willshire, 20-13; and Brian Miller, Stuart Hemmings and Steve Cantley 19-12. Only one team were in action for the Fed 4’s the San Miguel Cherokees were home to San Luis Ospreys with San Miguel Cherokees winning 6-2, (64 shots to 42), the best win for the Cherokees came from Brian Miller, Dave Johnson, Mary Dyer and Steve Cantley winning 32 shots to 10. 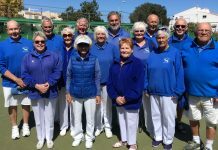 Both teams were in action on Friday; San Miguel Bulldogs were home to La Siesta Blues winning 7-5, (83 shots to 72), the best trio were Anita Brown, Cliff Plaisted and Lynn Greenland winning 24 shots to 12. The San Miguel Boxers were in action against La Siesta Golds with a close result, losing by 5-7, 81 shots to both teams. The best trio were Stan North, Ann Allen and Dave Champion winning 20-13. A reminder that the Wasps sessions take place Wednesdays 1-30 for 2-00 – €5 for an afternoon’s bowling with shoes and woods available to borrow. 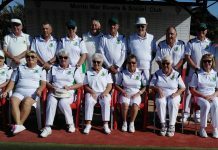 Due to the popularity of the Wasps, first time bowlers are asked to attend an initial coaching session on Tuesday afternoons, starting at 1-45. 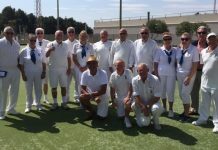 SAL Enterprise Division Albatrosses were at home to the Vistabella Drivers team who were a force to be reckoned with, they gave the Albatrosses a good game and came out on top. The Albatrosses winning on one rink to the Drivers four. Shots, Albatrosses 76(2) – 94(10) Drivers. In the Discovery division the Eagles travelled down to Mazarron to play their Mariners. They won on two rinks, lost by one shot on another and big defeats on the other two…tricky green! Shots, VB 70(4) – 103(8) M.
The Voyager division Buggies at home to Greenlands Chestnuts won on two rinks and drew another, the Chestnuts played a well and the end result could have gone either way. Shots, VB 90(7) – 77(5) G.
WINTER LEAGUE. Away to San Miguel, our first game this year and a bit of a struggle, we finished with two wins which dropped us down to third place in the league…plenty more games to come yet! Shots, VB 74(4) – 82(8) SM..
SOUTHERN LEAGUE div A. The Lanzadores were at home to Greenlands mighty Oaks but not too mighty on this day. We had three wins, two drawn games and a decent shot difference. Shots, VB 112(10) – 70(2) G.
The Picadors away to the San Luis Lions had a bit of a hiding losing on all rinks! Shots, VB 63(0) – 134(12) SL. 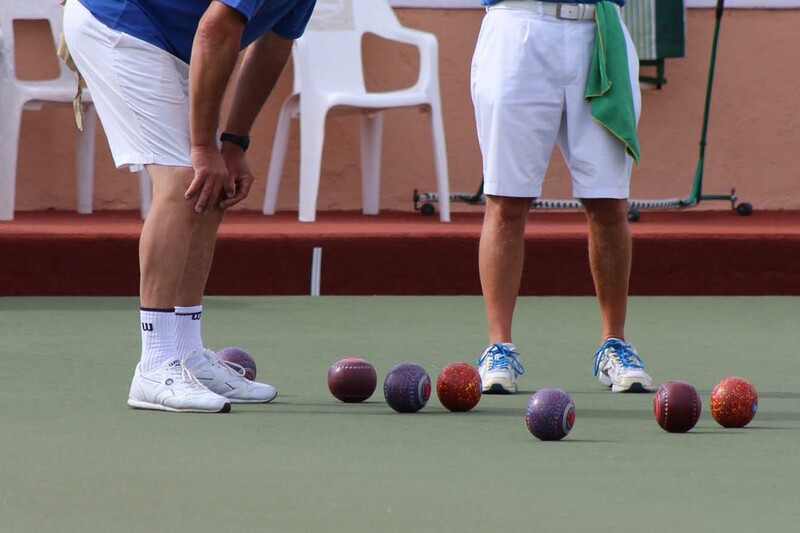 Div C Swingers played the Silvers at La Siesta, they had four good wins, one near miss and won the long game. Shots, VB 113(10) – 73(2) LS. Div C. The Conquistadores were at home to Emerald Isle Roundheads and what a result they had, four fantastic wins and only one defeat. Shots, VB 100(10) – 74(2) EI. The Flamingos flew the short distance over to Emerald Isle on Monday on what can only be described as a wonderfully sunny afternoon. On a serious note, at four o clock respects were paid to our dear departed friend and fellow bowler John Rimmer. At the ringing of the bell the games were halted, hats off, and a minutes silence ensued. We miss you John and will always hold you in our hearts. God bless you. It was good to be back at the Isle with the Saturns giving a good game. Shots, 110 – 76, Points 8 – 4. Well done to the Flamingos. On Friday at home saw the Mazarron Miners arriving to play the Geckos on a bright beautiful morning. A warm welcome from Country Bowls and the game got underway. In the afternoon the Cubs were back in action after the Christmas and New Year break. Travelling to the Emerald Isle with a tough opposition in the form of the Outlaws, the Cubs were out to secure points away from home. A well fought game throughout with some very close results and two rinks going down to the last ends. Overall a good result for the still growing Cubs, albeit an 8 – 4 win to the Outlaws. Winning rinks; Dave Belton, Derek Lewis & John Mallet, Dean Webb, John Burke & Andrew Bryce. The week started with a derby with the Raiders being at home to the Palominos, the Raiders being in general a more experienced side took the rinks by 4-1 and the overall shots. But both sides enjoyed playing their own club members, though as we know it can affect one’s concentration. Barbara Jones, Marion Haynes and Geoff Jones scored a ‘Hotshot’ and are probably justifiably feeling a little smug, well done! 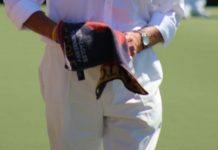 In the afternoon the Mustangs, playing in a lighter breeze and getting increasingly warmer, entertained Quesada Rubies and had a tight match ending with Quesada taking 3 rinks to the Mustangs’ 2, whilst the mustangs took the overall shots by a small margin and hence drawing the match. Friday found the Mustangs at La Marina playing the Ospreys and struggled on the day to overcome the Ospreys strong team and home advantage, coming away without a point, though putting up a good battle on two of the rinks. But such is life with many more fixtures to come. Meanwhile the Broncos were entertaining Quesada Swans and played a good all round match, gaining a well deserved 9 points, in taking 3 rinks and one draw, with the overall shots by a good margin. Graham Day, Marion Haynes and Dave Haynes 19-6. Chris Ziepe, Pam Harris and Brian Harris 15-15. Ann C Taylor, Denise Morgan and Keith Longshaw 31-7. Val Ryder, Barbara Jones and Geoff Jones 15-22. Suzette Ziepe, Steve Ziepe and John Ziepe 29-17. On Monday, in the Discovery Division, the Horadada Falcons were away to San Miguel Dalmations. Not a good day at the office I’m afraid, as the Falcons were well beaten by a better side. In saying that we had 1 rink who only lost by 1 shot. That is more soul destroying than losing by much more. Hard lines to Wayne Jackson, Les Davies and Mick Kirby. The final score was all 12 points going to San Miguel. The shots were 55 for to 120 against. Come on Falcons, keep going. We need to move up that table. The final score was 80 shots for to 89 against giving us 4 points to 8 against. We are at the start of a New Year so onwards and upwards Team Horadada.